In your review of the tenets of Agile, you missed a glaring one, a flat organizational structure. How many layers do you need? As organizations grow and mature, increase in headcount, I see the construction of too many layers. In an effort to create a flat organizational structure, I see too few layers. Looking at context, most problems and decisions for a small to medium enterprise (SME) fall into five levels. If we organize around the decisions and problems, we come up with a natural order of layers, not too many and not too few. S-I – decisions and problems at hand, where variables are known, concrete, tangible. S-II – decisions and problems of intention, related to quantity, quality and time. This is the land of supervision and coordination. These are short term variables (up to 12 months). S-III – decisions and problems related to variables that fall along one specific critical path, or system. Intentions for system output are consistency and predictability. Goals and objectives up to 24 months. S-IV – decisions and problems related to the existence of multiple systems (multiple critical paths) that must be integrated for total system throughput. Goals and objectives up to 60 months. S-V – decisions and problems related to the enterprise in the context of its market (external system). Goals and objectives range from 5 years to 10 years. It’s all about context related to decision making and problem solving. What is the level of decision making, what is the level of problem solving required? As the organization grows, it must meet those decisions and problems with the people who have the capability to make those decisions and solve those problems. The people in those positions must be able to bring value to the decision making and problem solving of the team one level of work below. And, that’s how many layers you need. This entry was posted in Accountability, Levels of Work, Time Span and tagged flat organization, levels of work, reporting on February 1, 2019 by Tom Foster. 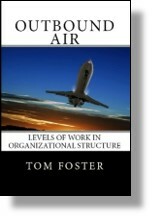 Tom, I agree with your comments that organization structure is about decision making and problem solving. Let me add the term ‘span of control’. Consideration needs to be given to how many subordinates, i.e., workers or other leaders of teams, can effectively lead. Aka, how many machine operators (S1) can a team leader (S2) coach/manage; how many team leaders (S2) can a supervisor (S3) coach/manage and up we go. In operations/phone centers and such the best seems to be between 10 and 15. At the top of a large firm, even a CEO (S5) should have only so many direct reports (S5s or 4s), usually broken into categories such as finance and admin, operations, and marketing. the variations are endless demanding upon circumstances. I have walked into organizations wherein the CEO has 15(!) direct reports. An extreme for sure, but when does s/he get to sit back and think? When do S3s get to work on process improvements and not just give performance reviews?